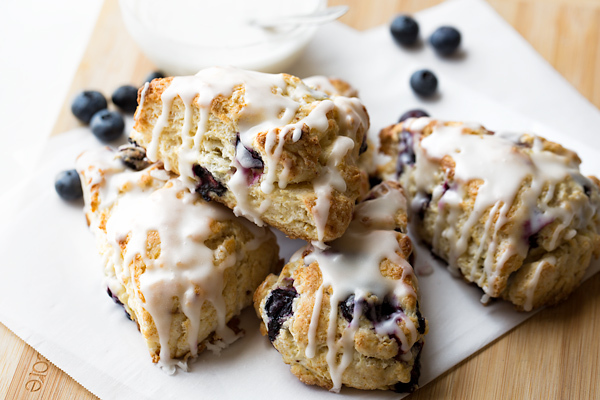 For me, there’s nothing quite like fresh-baked blueberry scones on an easy-going morning, especially when the process of preparing them is as sweet as the scones themselves! Filled with fresh, plump blueberries, a little whisper of lemon, and a simple buttermilk glaze gently drizzled over top—they’re so perfectly sweet, delicate and crumbly-yet-moist, it’s quite impossible for me to eat just one, truth be told. I love the slow and gentle pace of a weekend morning—especially a Saturday morning—when there isn’t much on the agenda, and there’s an abundance of time for me to shuffle around in my robe and slippers, not feeling any real sense of urgency or the pressure of a schedule. Granted, the weekend mornings are not always like this, but when they are, they are a dream. They offer me the perfect opportunity to bake up something fresh, warm, and comforting to enjoy and share with my loved ones as we all slowly wake up, which is probably the best part about them. The impromptu nature of whipping up something delicious and cozy that I hadn’t planned until that very moment, brings such serendipitous satisfaction with every bite of the fruits of my labor. The key to making delicious blueberry scones, or any other scone for that matter, is to keep the butter and the liquid—either half and half, buttermilk, or cream—very, very cold. This allows for the dough itself to remain as cold as possible before being baked, which then yields that soft-yet-crumbly texture we love in scones, one where the cold pieces of butter melt slowly into the dough forming those tender layers. And once I combine all of the sweet ingredients, and shape the slightly sticky dough into a disc and cut it into wedges, I chill it once more for about fifteen minutes while I preheat my oven and prepare the glaze. Just before baking, I brush each scone with a little bit of the cold liquid I used to prepare them, then bake them at a nice high temp, just until they are a pale golden color. 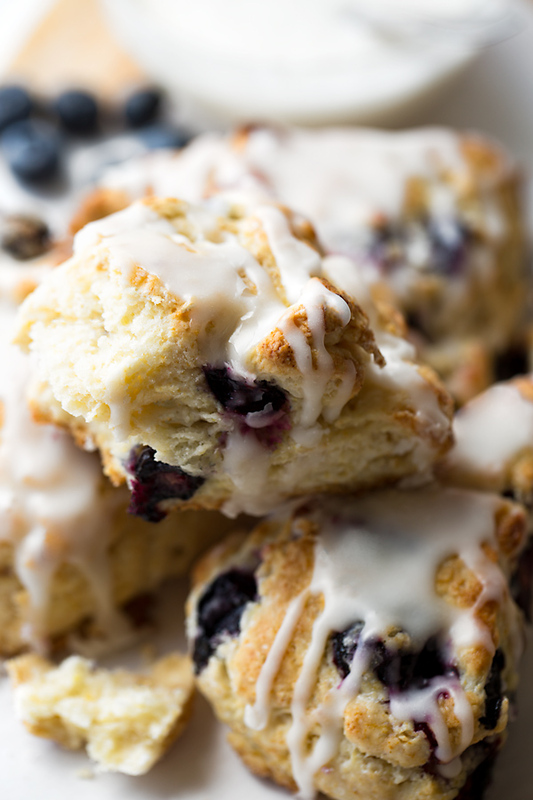 The resulting aroma, flavor and texture of these simple little blueberry scones is so inviting and wonderful! They’re a real treat for those weekend mornings when things are a bit more easy going and relaxed, or anytime you find yourself craving something sweet and homemade. Keep things chilled: Always keep your butter and your liquid as cold as possible, for as long as possible, when you’re preparing your scone dough; and chill your dough before baking, as well. Choose your liquid: I like to use half and half in this recipe, but I’ve used all cream and also all buttermilk for scone recipes as well. I like the half and half because it isn’t full-fat like cream, but it does add a bit more fat than buttermilk does; and yet, buttermilk will provide a tiny touch of tang, and also tenderizes the dough. 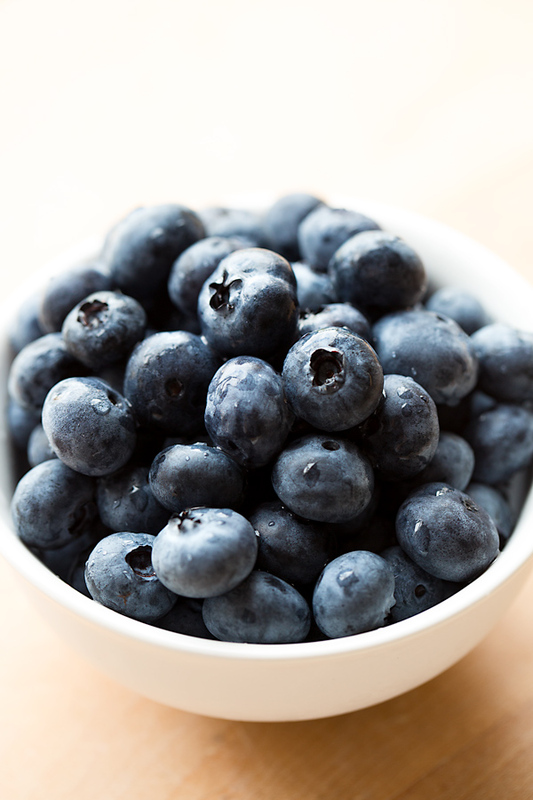 Fresh blueberries are best: When sweet, fresh blueberries are available, I prefer to use those because they’re so plump and juicy, and won’t release any extra water as frozen ones may. But in a pinch, feel free to use frozen blueberries—just don’t defrost them. Give the tops a little brush of liquid: To keep the exterior moist and help it to become golden, brush a little bit of the half and half (or whatever liquid you choose to use) over each scone wedge prior to baking. Before you glaze, allow the scones to cool slightly: You can glaze the scones immediately after they come out of the oven, but if they’re still too hot, the glaze will sort of melt over top and may run off. I like to allow my scones to cool slightly so that the glaze will stick a little better. If you don’t have buttermilk for the glaze: You can substitute sour cream, milk, or even some of the half and half if you don’t have buttermilk for the glaze—it’ll still be delicious! 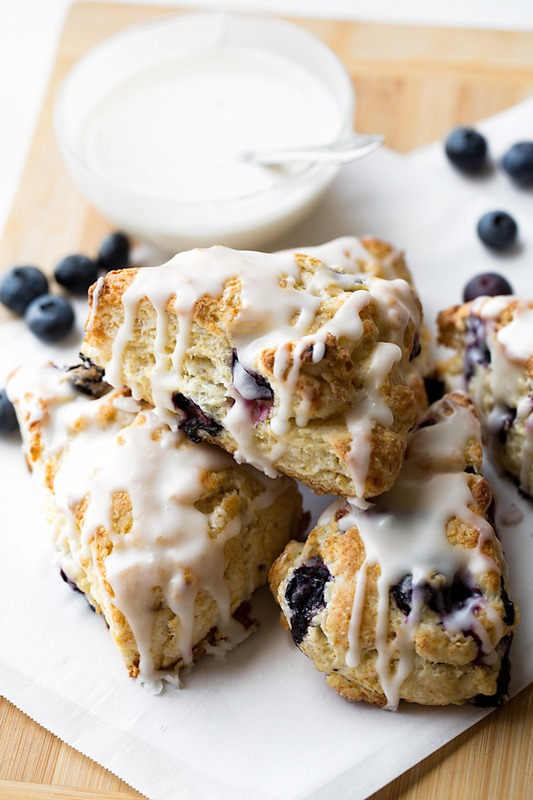 These tender-yet-crumbly blueberry scones with buttermilk glaze are a perfect treat to prepare on a leisurely weekend morning, or anytime the craving hits for fresh homemade scones! –Line a baking sheet with parchment paper. –To a large bowl add the flour, sugar, baking powder, salt and lemon zest, and whisk to combine. –Add in the cold butter, and using a fork, a pastry cutter or knives (I actually use my fingers), cut the butter into the dry ingredients until it resembles a pea-size crumble. –Drizzle in the cold half & half, along with the vanilla, and add in the blueberries; using a spatula, fold the liquid and blueberries into the dry ingredients just until everything is incorporated (take care not to over mix). –Turn the dough out onto a lightly floured work surface (it may be slightly sticky and crumbly), gather it up, and pat into disc about 1/2 – 3/4 ” thick; cut into 8 scones, place onto the prepared baking sheet, and chill in the fridge for 15 minutes. –Preheat the oven to 425. –Prepare the buttermilk glaze by whisking together all of the ingredients in a bowl until smooth, thick, and creamy; set aside. –Brush the tops of the scones with the remaining 1-2 tablespoons of half & half, then bake them for 18 minutes, or until golden-brown; allow them to cool slightly, then drizzle with the glaze, and allow that to set for a few minutes. Enjoy! 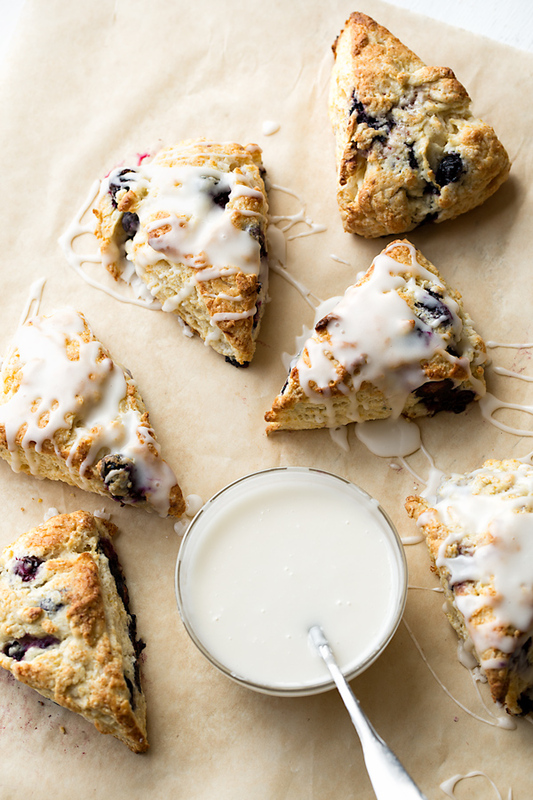 Hungry for more tasty scones recipes? Check out these Maple Pecan Scones and these Lemon-Apricot Scones! I love your web site and have greatly enjoyed trying your recipes. Here’s my problem when making muffins anyway i inevitably over mix, to the point that Iam afraid to try these scones. By any chance have you made a video on the correct method of combining until just moist? Of course I can try YouTube, and in desperation I will. 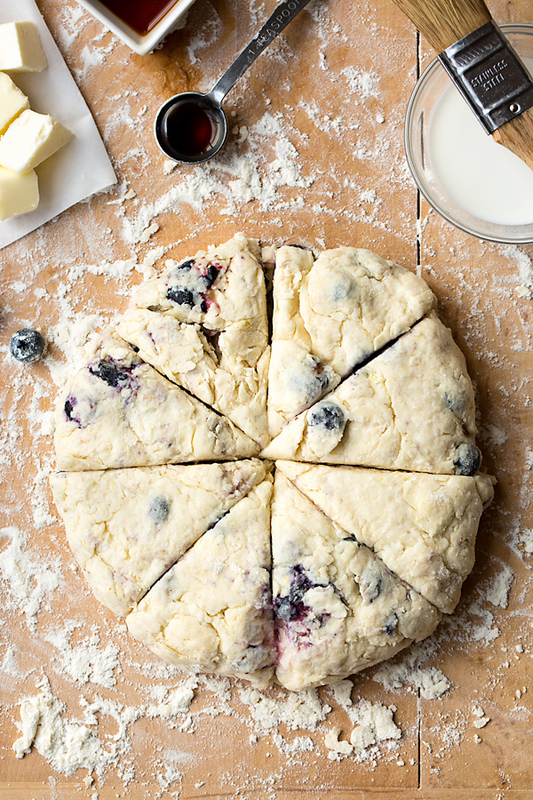 For the love of blueberry scones. My dear Laurel, thank you so much for such a precious, kind and candid comment! I’m thrilled you’ve been enjoying the website, and finding some recipes to tantalize your tastebuds. I wish I could point you to a video that we have for this, but let me tell you that you gave us a good idea with this topic, in particular. We haven’t done videos in a very long time, but plan on eventually getting back to doing some, perhaps shorter ones with very specific aspects of a recipe more than the whole thing. I would tell you this in regards to mixing (scones, muffins, cakes, pancakes, pretty much anything to do with baking): once you see that the dough or batter is all pretty much moistened and combined, stop there. I know the tendency is to want to make sure that everything is perfectly mixed, that there is no visible flour left; but as long as you fold sort of up and over from the bottom of your bowl, turning it as you go, and go around a few times until you see things coming together (it’s OK if there are a few tiny patches of flour), you should be good. Honestly, it really isn’t quite that sensitive; but when folks keep going and going, and mixing and mixing (I think we must get mesmerized by the process or something), that’s when those glutens develop from the flour. But a a few good passes are not going to be too much. For these scones, you will see the dough begin to come together in a bit of a “shaggy” mass, and that’s about all you’re going to get from it; it won’t look all that “moist” or wet, necessarily. Once it’s shaggy and coming together, I turn it out onto my board at that point, and begin to actually gather it up into a cohesive dough ball (it will be crumbly! ), pressing with my hands lightly to bring it together and form a disc shape. It does take a little patience. Like I said, it will be crumbly, so do your best to press it together and form it into that disc you see in the picture above. You’ll do great! These babies are nothing to “fear”, lol! Look at this all as practice, and you’ll get better and better as you go. And thank God it’s only food, right?! Have fun! Hope you enjoy! I found your blog in searching for blueberry scone recipes; checked out a bunch and yours seemed the most like what I was looking for. I have to say, these came out perfect! I think the 15 minute rest in the refrigerator was key, and the flavor is amazing. Not too sweet, nice texture, just great all around. Thanks so much! Hi Colin, I’m so happy to read that! I love it when someone sort of “stumbles” upon the site in search of something specific that they’re looking to try their hand at, and then the recipe turns out as they hoped. I’m thrilled you enjoyed these (they’re one of my personal favorite sweet treats! ), and that you’ve now got a recipe to go to for when the craving hits! Thank you for your comments. Hello! I wanted to share my experience with making these vegan. I’m not personally vegan, but the substitutes I made to accommodate my allergies made it so by default. I kept all quantities as you listed. I used coconut oil, coconut milk (from the carton, not the can) and whole wheat flour. With the whole wheat flour, I sifted it before measuring and tossed the extra germ left behind after sifting. I used fresh-then-frozen blueberries, which helped keep the coconut oil cold. I brushed the tops with coconut milk. Exactly as you mentioned in a prior comment, I turned them out onto my pastry mat after just combining ingredients. They were crumbly and I did have to form them into the round shape before cutting. I know folks may comment from time to time and ask about substitutions. I wanted to share mine since they were successful. Thank you for the wonderful recipe. Hi Tori, my pleasure! And thank you for sharing your substitutions for a vegan version of these in case others would like to follow. Is this a revised version? I feel like I’ve used your recipe before but it was without the buttermilk. Still a lovely taste with it. Hi Katie, no, this recipe has not been revised. I do have several other scones recipes on the site—perhaps you have tried one of those? However, this particular recipe does not actually call for buttermilk in the scone dough portion of the recipe—I use half & half there. The buttermilk is only used in the glaze.